My adventures in sewing began many moons ago in my teenage years, sewing clothes for myself as I found it hard to find skirts and dresses long enough for my tall frame. I think I had a bit of a ‘Pretty in Pink’ fetish and imagined myself as the Molly Ringwold character, dressed in customised and handmade clothes-If only I were that cool! I did my degree in English and teacher training, so had no real call for the sewing machine, but over the years I made anything I needed, from curtains, to table runners to santa stockings. I guess I sewed for necessity and hadn’t considered using it as an art form. I had painting for my creative outlet and spent many a happy hour sketching and painting in my pre-children life. Whenever I wasn’t at work, I wanted to be painting. And really, that’s where the story of Oh Sew Lovely begins. I continued painting after the birth of my daughter, but once my son came along two and a half years later I found it impossible to find the time or space to paint. I started making dolls clothes for my daughter’s rag doll and at the point her doll was the best dressed in town, I found I could sell them on line, so started designing all manner of outfits. After a year of this I branched out into bunting and hanging hearts and over time all kinds of knickknacks that I could sell at craft fairs. I guess that although I loved the buzz of selling my wares to appreciative customers, I missed designing and creating something unique. I missed painting. Things kind of developed gradually as i started designing sewn cards and then pictures, but the breakthrough truly came for me when I made a very special cushion a couple of years ago. My partner and I had been watching the wonderful film ‘About time’. 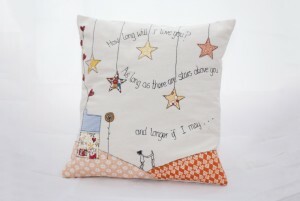 We were so moved by it and the main song, “how long will I love you” by Jon Boden, that when he moved in a few weeks later, I designed him a cushion with the words from the song on it as a moving in gift! He love it and I posted a picture of the cushion on Facebook. I got so many positive comments and requests for me to make them to sell, that I started designing other cushions and pictures. The rest, as they say is history. That kind of brings the story up to date. That’s how I came to do what I do. I love being able to combine art and textiles and I love creating something totally unique and seeing the joy people get from giving and receiving bespoke gifts. I have so many ideas, but never enough time to sew them all. I paint (and sew) with the children and maybe one day I’ll get the oil paints out again, but I do feel I have found the perfect creative outlet with what I do now. My children are now 8 and 10 and they love to sew, especially my son, who says he will help me make my cushions when he is older! I have been designing, making and selling all the items you see on the website for the last couple of years, via word of mouth and my Facebook business page. I have finally decided to take the leap and put it ‘out there’ in the virtual word and see what happens…I would love to have some feedback, share your creative stories or just pop by here and say hi.